The town of Ciudad Quesada is a relatively new town that was established in 1972 by Justo Quesada Samper, a remarkable man who wanted to create a place where people could enjoy the Spanish way of life. 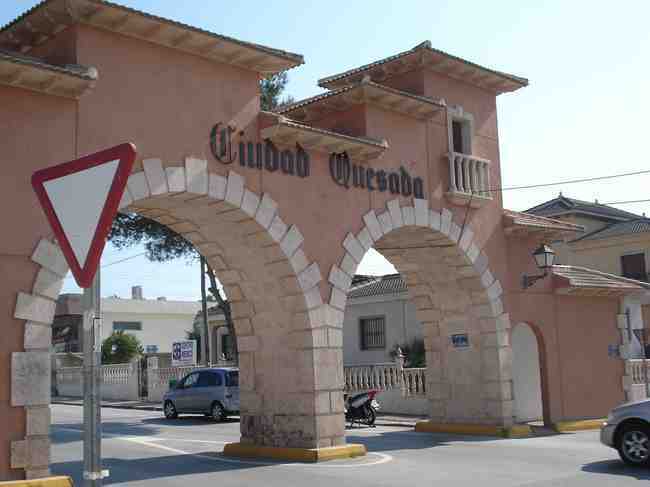 Such was the success of his work at Ciudad Quesada that in 1999 Quesada was awarded its own Town Hall. In contrast there is the delightful town of Rojales with its olde world Spanish style and the famous shell house. Rojales has a large artisan community based in its cave houses and the children will love the huge water park at Rojales with its kamikaze slide amongst others and it’s gentler water slides for smaller children. Ciudad Quesada is entered through an impressive archway leading to the main street full of shops, bars and restaurants plus a medical centre and well attended social club. The views are spectacular in Ciudad Quesada ranging from spectacular views over the very exclusive La Marquesa golf course and over many neighbouring towns and villages all the way across the salt lakes and natural parks of La Mata and Torrevieja then beyond to the beautiful blue Mediterranean. The salt flats of Torrevieja and La Mata have cycling and walking routes mapped out and there is a small tourist information office on the N332 at La Mata. Ciudad Quesada is well situated, close to La Marquesa golf, the AP7 Motorway is minutes away, for both Murcia and Alicante El Altet airport as it takes little more than 30 minutes to drive there, the spectacular beaches of the Costa Blanca are just a 10 to 15 minute drive at either Torrevieja or the wonderful Guardamar del Segura with its miles of golden sandy beach and coming to the area soon is the fabulous Paramount Theme Park which is due to open in 2015 and is said will be the largest them park in Europe this is 40 minutes way. So due to its exclusive location, close to La Marquesa golf, its proximity to the beaches of the Costa Blanca, the Orihuela Costa, the Costa Calida, the Mar Menor and not forgetting the Paramount theme Park with the predicted 3 million extra visitors it will attract to the area each year means that should you own a property in Ciudad Quesada it will not only have fabulous rental and growth potential but it will provide everything ever needed to enjoy the Spanish lifestyle. Ciudad Quesada is a very residential area with a huge variety of different properties and house styles. The properties in Ciudad Quesada range from one bedroom holiday apartments to magnificent detached villas, bungalows and townhouses gazing down into the beautiful valley and over to Rojales hills. Great care has been taken to make sure that they blend in with the natural environment, this is a very special place in which to live. See below to view a selection of our bargain properties in Ciudad Quesada.